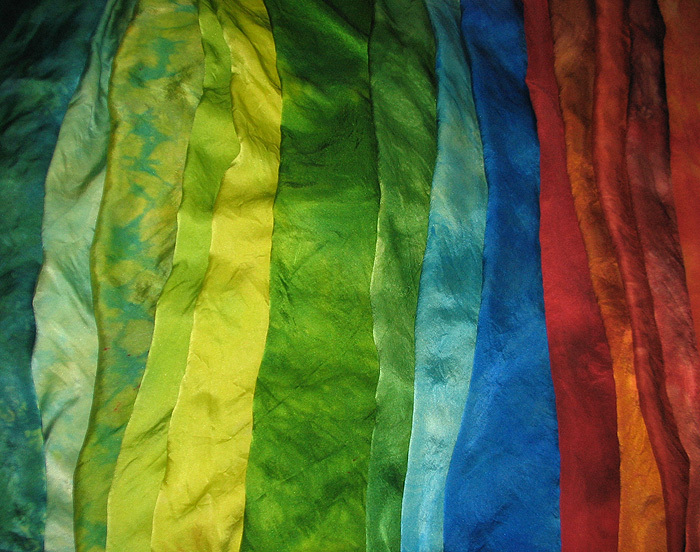 Spent a recent morning acid dyeing lots of half yard pieces of silk charmeuse. Luscious colors! I love charmeuse for the sheen and how it drinks up the color. After I cherry pick a few spectacular pieces that I can’t part with, the rest will be up for sale during the Brattleboro WestArts Open Studio Tour September 25th-26th. There will also be some beautiful hand dyed cottons, new small mounted work as well as large pieces. This entry was posted on August 31, 2010 at 8:14 am and is filed under Dyeing, Process. You can follow any responses to this entry through the RSS 2.0 feed. You can leave a response, or trackback from your own site. I know, Jeanne! I love the way light slightly shifts the color when I change viewing position. Is this what you use for those beautiful scarves I see on your blog?